Project Reporting is a useful tool when you want to view aggregated information about the total time you spend on each project, per period. It helps you view which of the projects are billed or not, per customer. This report collects all of your projects and, depending on the criteria you choose, grouped accordingly (per customer / billing method, etc.). In order to view projects reports, visit Reports -> Projects report. 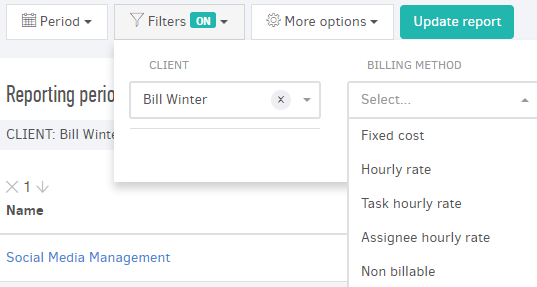 From the Period button, you select the interval for which you will see total hours per project, and in Filters you can choose between client and billing method, for more targeted results. From the More options button, you choose the columns the table will contain and how the projects will be grouped. 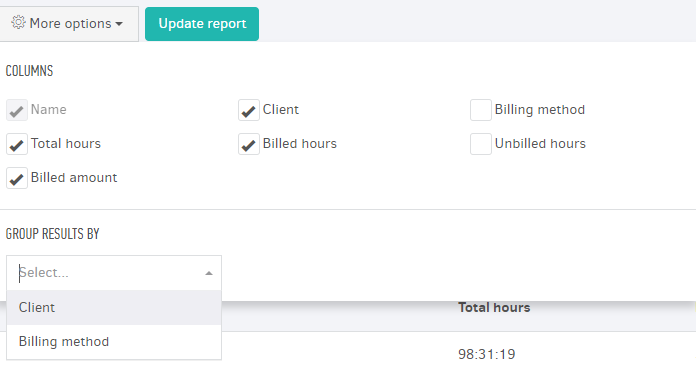 Clicking Update reports, Elorus will create a list of with subtotals for each grouping and at the end of the table you can view totals for billed and unbilled amount and hours. Like all reports, you can export the projects report to an Excel or PDF file by clicking Export button, found at the top-right of the page.